When you have a series as volatile as Singapore's non-oil domestic exports (NODX), missing a consensus number isn't a big deal, unless you miss it by miles. And the -2.7%YoY March figure for NODX is not all that far off the 1.2% gain expected by forecasters. This is well within the probable forecasting error range to ignore. But we can't leave it there. The Monetary Authority of Singapore (MAS) moved to an appreciating trend earlier in the month with respect to the nominal effective exchange rate for the Singapore dollar (SGD NEER), so we need to dig into the export figures a little more to see whether this trade data provides some vindication for what was, in our view, a very marginal decision. In order to make some sense of the NODX figures, we look at its constituent parts and try to pull out any emerging trends. This month, the one saving grace of the export data was the sizeable "other" segment, which doesn't help analysis much. Most analysts look at year-on-year growth for NODX, though this is usually dominated by the previous 12m history of the figures and doesn't always reveal very much. Right now, this shows exports of machinery down about 30%YoY, with all other components also down from a year ago, except again for the "other' category of miscellaneous goods. Year-to-date year-on-year figures tell much the same story - machinery is well down, and most categories are a bit softer year-to-date, with the exception of "other" and petrochemicals. Another way of breaking down the data is by looking at the 3m sum on the previous 3m sums annualised, or 6m on 6m annualised. 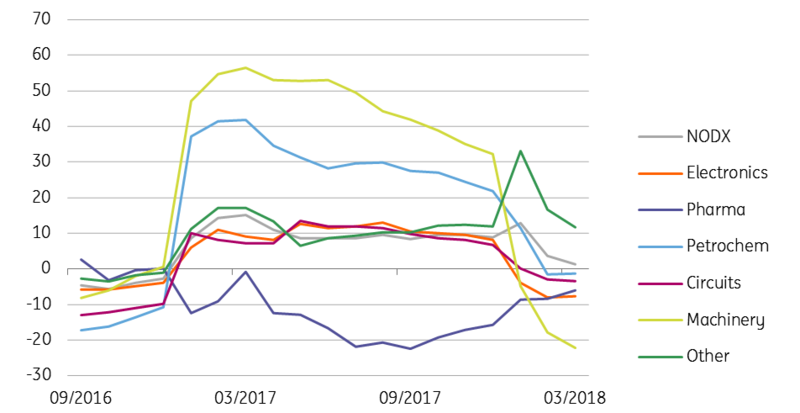 This encounters seasonality issues, but bears out the other data, with the only addition that the pharmaceutical industry, the sick-child of 2017, seems to be staging a recovery of sorts, though as it accounts for only about 12-13% of total exports, it will have to outperform spectacularly to offset weakness elsewhere. But perhaps the most interesting part of this data is electronics. Accounting for about 30% of total non-oil domestic exports, electronics are down whatever way you measure them. And having been one of the strongest elements of the Asian export story for 2017, this is a little worrying. So returning to our original question, do these data vindicate the recent MAS tightening decision? The answer is no. That does not mean this decision was misplaced, but that we need to find justification in other areas of the economy, namely domestic demand to justify this decision. For example, recent strength in retail sales will need to persist if we are not to see the MAS reverting to a flat NEER trend later this year.